So, it’s fair to say Netflix’s Bird Box set Twitter tweeting and Facebook and instagram into meltdown! 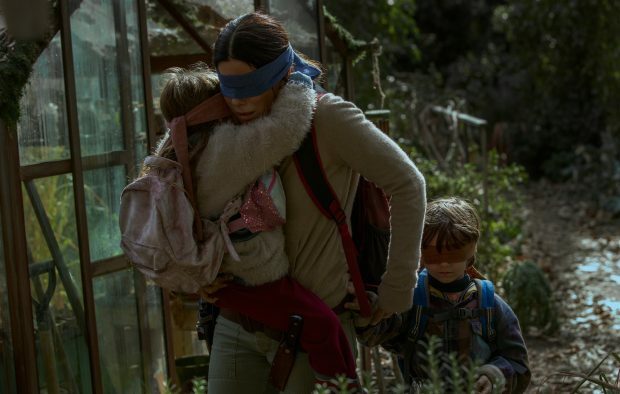 Immediately everyone started sharing opinions and Bird Box-inspired memes, plus Netflix took the step of sharing that over 45 million accounts watched the movie in its first week. Given how closely Netflix guards its viewership figures to its chest, this is particularly interesting. 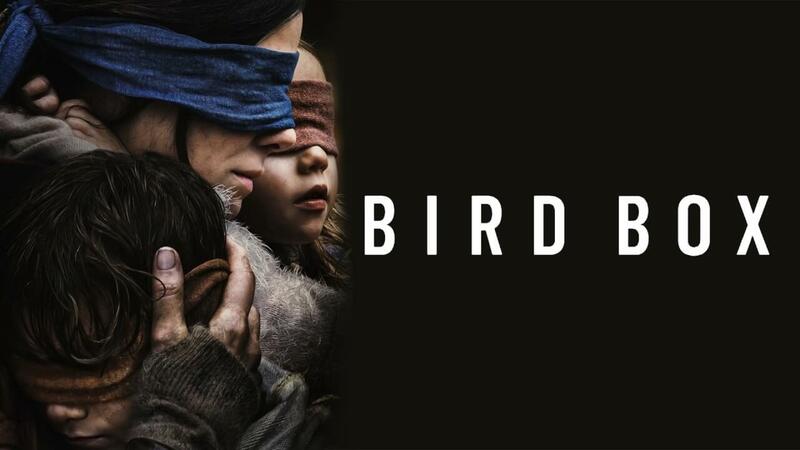 Bird Box was one of my favourite reads of last year, plus the adaptation’s screenwriter is Eric Heisserer, who also adapted the Oscar-nominated Arrival (read Arrival‘s own ‘Book Versus Film’ HERE). I also interviewed Eric for my non fiction Drama Screenplays book because he wrote and directed one of my favourite dramas Hours, starring the late Paul Walker. With this in mind then, it’s also fair to say I desperately wanted his Bird Box adaptation to be good. Read on then, for my thoughts on both the book AND the film … Be sure to add your thoughts at the bottom of the post, but please – keep it courteous. Ready? Then let’s go! ‘Something is out there, something terrifying that must not be seen. One glimpse of it, and a person is driven to deadly violence. No one knows what it is or where it came from. 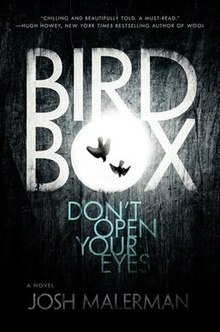 Written by Josh Malerman, Bird Box was one of my very last reads of 2018 … And I flew through it in just a few hours! The tension in it is fantastic and it is one of the most terrifying books I have read this year. I read it on a plane and thank God for that, if I’d read it in my hotel room I don’t think I would have been able to sleep! Unfortunately for me however, my bedroom at home is in the eaves … Fellow readers, you know why this was scary! Anyway, we follow Malorie, responsible for her two children and completely alone with them after a terrible disaster. The book follows two timelines: one in which Malorie and the children go down the river (hopefully) towards a safe haven. The second follows the pregnant Malorie and her sister Shannon, then Malorie finding the other survivors after her sister’s death … Only for a terrible betrayal in the shared house to rip the band of misfits apart. The concept of this book is so original. There’s a lot of people online complaining it rips off The Quiet Place, but this is BS; the book pre-dates that one by years. Whatever causes the problem here, it starts like so many disasters: no one really takes it seriously. Reports on the news speak of people going insane, then killing themselves and sometimes, others too.First people assume it’s a hoax, but then they are forced to confront the harsh facts: something is out there and making this happen. I was so impressed by how plausible Malerman made this quiet, blind-folded world: he literally thought of everything! At one part, he describes how Malorie has to train the babies to wake without opening their eyes. Something so small, yet it could mean everything. The children were just babies too, so Malorie is forced to train them by standing over them and waiting for them to wake … And hitting them with a fly swatter if they open their eyes. Brutal and unfair, yes. But necessary? Also yes. They could die. The ending worked overall for me, especially in the second timeline: the ‘creature’ in the attic with Malorie and the babies was fantastic, but it just felt a little rushed. I felt like several characters simply ‘disappeared’ because they were no longer needed, Tom in particular. Given how much time he’d had in the novel – we see several chapters from his POV, even! – I felt a little cheated. Reading other reviews, this seems to be a fairly common feeling from other readers and I believe they are reacting to the same feeling of being ‘rushed’ or ‘cheated’ like this. Even so, Malerman creates a complex, compelling character in Malorie. 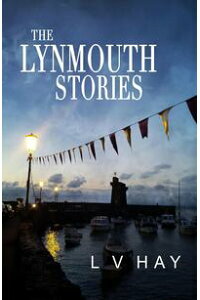 She is only young in the book – early twenties – but is plunged into a nightmare and responsibilities she could never have foreseen. She is savvy and smart too. She is the one who doesn’t trust Gary; she even thinks about maiming the children’s eyes with bleach, so they might be safe. None of this comes easy to her: she wants to be a good mother, plus she worries the children have no childhood. But she doesn’t know how else to deal with the dire situation and keep them safe. First up, there are no ‘creatures’ in the film. In the book, Gary says he’s seen ‘hundreds of them’, suggesting it is not just one and this is an invasion story of some kind. Charlie in the film posits the notion of demons and supernatural elements, suggesting that *whatever it is*, it confronts you with ‘your worst fear’. Whatever the case, this apparently lead to some creatures actually being made for the movie, which you can see HERE. The creatures ended up on the cutting room floor, with the phenomenon becoming an unseen ‘force’ instead. I think this works MUCH better, though it does mean the cool attic scene after Malorie’s child’s birth is lost. On balance, I think this was a good decision – what you DON’T see is always scarier. Sandra Bullock plays Malorie, so she is obviously much older than the character of the book. They seem to play it up a little as her ‘last chance’ to have a child, though she is fairly ambivalent about having a kid as a single mother. The doctor at the sonogram even gives her a leaflet on adoption. As already mentioned, the book accesses Malorie’s changing and sometimes contradictor thoughts on motherhood. Being a movie, it is visual, so Malorie needs to have an arc that takes her from one place to another: she’s not sure motherhood is for her, then she discovers she CAN keep the children alive … Then she must learn what it is to *be* a mother. I think that’s what I liked best about this story: so many books and movies idealise motherhood in general. In the past thirty years too, modern feminism has reminded us there is no ‘perfect’ mother and that is okay. Also, science fiction too often reverts to the ‘Mom Warrior’ trope when kids appear in the narrative, thanks to Ripley in Aliens. That was ground-breaking in 1986, but is old news now. There are other changes because it is a movie. Like the creatures, they lost the wolf attack and the birds all dive-bombing one another overhead, which reminded me a little too much of the ending of Pitch Black. Also in the book, Malerman can afford Malorie and Shannon holing up for weeks alone. This is not possible pacing-wise in the adaptation. When the ‘force’ strikes here then, it is on the way home from the sonogram. Malorie’s sister in the film is called Jessica and it makes her crash the car, then kill herself. Malorie ends up rushing with other survivors and gets rescued by a woman because she is pregnant, which is a great touch. From there, she ends up in the house with the other survivors, where events play out loosely similar to the book. The parenthood theme is underlined again when two peripheral characters rush out again to try and save their children. The characters have other small changes – Don from the book is now called Douglas and has a much more antagonistic function. This means Gary has a much smaller part, though he is still then one who betrays them all. Here instead of going along with Gary, Douglas redeems himself by sacrificing himself for Malorie and the babies. It’s Act 3 where the most significant changes happen because Tom DOES NOT die when Gary pulls the blinds down from the windows. Instead, he is knocked out by Gary first and so lives to help Malorie at first with the children. The filmmakers also use this time to underline the fact there are people outside who are looking at the ‘force’ without blindfolds, like Gary, yet are not killing themselves. Like the book, the movie never explains this absolutely: are these people ‘immune’? Or is it because they are already mad? It doesn’t matter and it works brilliantly. Like Gary, these people are a threat to Malorie, Tom and the children. When they attack, ex-soldier Tom has to sacrifice himself for them. It’s how Malorie ends up on the river with the children, too. It’s a masterful piece of plotting, because it neatly side-steps the issue of ‘why now?’ in terms of Malorie setting off. It also harks back to the ‘fisherman’ earlier in the narrative in Act 1 in the ‘present’ thread, who attempts to pull Malorie’s blindfold off in the boat. So going back to Malorie: she is a modern version of Ripley in that she is a protector of children … But she is not a ‘Mom Warrior’ … Though she IS the last part, she is not a Mom at all, in real terms. This is the same in both the book and movie, though inevitably the book has the edge of the psychology of this.The movie keeps Malorie’s decision too call the children just ‘Boy’ and ‘Girl’, with Malorie renaming them Tom and Olympia when they reach the school for the blind at the end, which is a great decision. Yet little children do deserve a mother, regardless of the terrible things going on around them. Heisserer and Susanne Bier (the film’s director) reminds us of this via Tom’s character, especially in Act 3. He and Malorie argue about him telling the children stories in the garage, which Malorie realises is her mistake when Girl runs away from her in the woods. Tom also talks about his tour in a war zone, helping the man take his children to school. These moments, especially when Malorie calls to the girl in the woods saying she DOES love her, are really effective. This one is another tough call, because I genuinely love both the book AND the movie, but for different reasons. Whilst Malerman has the edge on the psychological nature of Malorie and the angst she goes through alone raising the babies, I think Heisserer does a great job of bringing this to the fore in visual ways in the movie. I also think he is a plotting master in terms of pulling the two timelines together. I also think Tom living to help Malorie at first is much stronger, plus I like the fact the movie has a much more diverse cast the book (to be fair Malerman does not write UNdiverse characters, he just doesn’t mention much about characters’ races, ages, etc). But with these three ‘extras’ in my mind, I think I would say the winner has to be the movie. 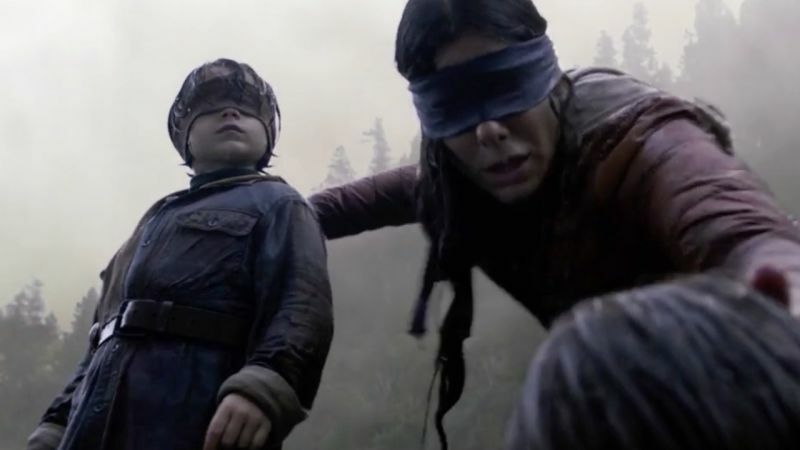 I got sucked into watching Bird Box by my 15 year old daughter. I hadn’t read the book as I tend to avoid horror and sci-fi as genres. Not because I find them too scary or weird, but rather because I find the vast majority of books and films in these genre tend to be quite boring and lacking in depth. Well, if Bird Box is representative of what’s happening now in these genres then I may well have to widen my range of viewing. 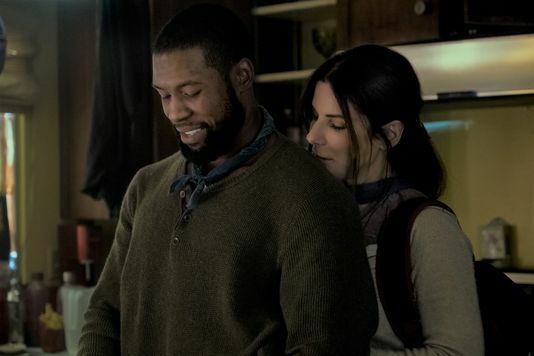 To my great relief , Bird Box was more psychological drama than horror or sci-fi, and I couldn’t agree with you more Lucy, a story very well told. Watching it also gave me to chance to enjoy time with my daughter, watching a film of her choosing. The best surprise of all came just after we’d finished watching when she compared it to other films she had until then thought brilliant. ‘They seem a bit shallow now’ she said. Result!